If you are looking for a quality rental vehicle that is comfortable as well as classy then this is the car you will want to look into first! 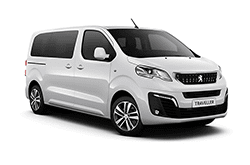 The Peugeot Traveller is a quiet and spacious MPV that can rival some executive saloons for comfort and special features. It gets great gas mileage and is an all-around fun vehicle to drive! The Peugeot Traveller features a full 9 seating capacity and with 4 door access you can get in and out with ease and can quickly access everything you are carrying with you. To see for yourself what all the fuss is about and why this rental is so popular, check it today and make your reservation with us now. Don’t wait another minute to secure one of the best vans available!